Existing research offers little guidance to policymakers who want to understand the interactions between economic fluctuations, growth, and stabilisation policies. This column introduces a Keynesian growth framework that provides a theory of long-run growth, built on a Keynesian approach to economic fluctuations. In the model, pessimistic expectations about future growth can give rise to stagnation traps. It suggests that monetary policy during a stagnation trap is hindered by credibility issues. Since the Global Crisis, productivity growth has slowed markedly in most advanced economies (Adler et al. 2017). For instance, weak productivity growth in the US and the euro area, has caused a large deviation in output from pre-crisis trends (Figure 1). This has caused a lively debate about the role of policy, especially monetary policy, in reviving growth (Yellen 2016, Obstfeld and Duval 2018). Through which channels does monetary policy affect productivity? How should monetary policy be conducted in an economy when productivity growth is low? These questions are at the forefront of the monetary policy debate. Notes: Series shown in logs, undetrended, centred around 2007. Linear trend is computed over the period 1998-2007. Research on business cycles has focused on fluctuations around an exogenous and stable growth path. Research on endogenous growth has studied the determinants of trend growth, largely abstracting from business cycle fluctuations. In sum, the macroeconomic literature offers little guidance to policymakers seeking to understand the interactions between economic fluctuations, growth, and stabilisation policies. In our recent work (Benigno and Fornaro 2017) we proposed a 'Keynesian growth framework' that would be able to reconcile these two paradigms. We have called our framework 'Keynesian' growth since it provides a theory of long-run growth that builds upon a Keynesian approach to economic fluctuations. Our theory brings together the Keynesian insight that unemployment might arise from weak aggregate demand, with the notion, developed by the endogenous growth literature, that productivity growth is the result of investment in innovation by profit-maximising firms. In our model, there are two types of agents: firms and households. Firms' investment in innovation endogenously determines the growth rate of productivity and potential output of our economy. Households supply labour, consume, and participate in financial markets. Nominal wages are partially rigid, as is traditional in Keynesian analyses. This friction implies that unemployment due to weak aggregate demand is possible, and that monetary policy can affect the real economy. There are differences from traditional models. In our Keynesian growth framework business cycle fluctuations can have an impact on investment in innovation and productivity growth, and recessions might lead to permanent deviations from the pre-recession trend. Moreover, monetary policy can affect firms’ investment and productivity growth. Our framework therefore allows a rigorous analysis of the interactions between economic fluctuations, productivity growth, and monetary policy. The first lesson from this Keynesian growth model is that aggregate demand and productivity growth are tightly related by a two-way interaction. Healthy productivity growth sustains aggregate demand and helps monetary policy to stabilise the economy. In our framework household demand for consumption depends on expectations of future income, just as in standard macroeconomic models. 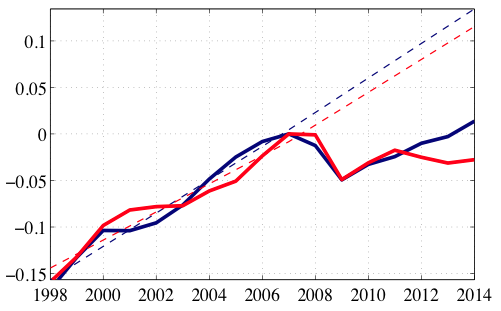 For example, a slowdown in the growth rate of potential output is associated with lower future income and a reduction in current aggregate demand.1 In turn, when aggregate demand is weak it is more likely that monetary policy will eventually be constrained by the zero lower bound, preventing the central bank from stabilising the economy. Hence, healthy productivity growth plays a key role in sustaining aggregate demand and facilitating economic stabilisation through monetary policy. Robust demand fosters productivity growth. In our framework firms invest in innovation to gain a monopoly position, just as in standard models of vertical innovation (Aghion and Howitt 1992), and so their investment in innovation is positively related to profits.2 Through this channel, a slowdown in aggregate demand, leading to a fall in profits, also reduces firms’ investment in productivity-enhancing activities. This effect implies that maintaining the economy at full employment creates an environment favourable to firms’ investment and productivity growth. Hence, our model suggests that healthy growth, robust aggregate demand, and resilience of the economy to business cycle shocks may be complementary. This suggests there are synergies between stabilisation policies and supply-side policies. On one hand, effective aggregate demand management is necessary to foster firm investment and productivity growth. On the other hand, pro-growth supply-side policies stimulate aggregate demand, and reduce the chance that monetary policy will be constrained by the zero lower bound. Turning to monetary policy, the Keynesian growth framework suggests that to stimulate productivity growth, the central bank should ensure that the economy operates at full employment. In fact, it is precisely when the economy operates at capacity that the incentives to invest in productivity-enhancing activities are highest. Empirical evidence recently provided by Moran and Queralto (2017), who found that monetary policy expansions led to increases in R&D investment and productivity growth, supports this conclusion. Second, the Keynesian growth model shows that interaction between aggregate demand and productivity growth may create fluctuations driven by animal spirits. Indeed, in our model pessimistic expectations about future growth can give rise to stagnation traps (protracted episodes of weak growth and high unemployment). What causes a stagnation trap? Consider a case in which agents suddenly turn pessimistic about future growth. Anticipating a fall in future income, they cut their aggregate demand. The drop in aggregate demand may be strong enough to push the policy rate against the zero lower bound, at which point conventional monetary policy loses its traction. The economy experiences a recession driven by lack of demand. This recession negatively affects firms' profits and their investment. Low investment translates into weak productivity growth, validating the initial low-growth expectations. Through this mechanism, pessimistic expectations can generate a long-lasting liquidity trap with involuntary unemployment and stagnation.3 This can last as long as agents remain pessimistic or until a successful policy intervention is implemented. Hence, in our model, a wave of pessimism about future productivity growth can generate an episode of secular stagnation. The liquidity traps experienced by Japan since the early 1990s, and by the US and the euro area after the Global Crisis, display all the symptoms of stagnation traps. Table 1 shows that all these long-lasting slumps have been characterised by high unemployment, low real interest rates, nominal policy rates close to their zero lower bound, in the context of slowdowns in productivity growth. The Keynesian growth model suggests that pessimistic expectations might have played a role in Japan’s lost decade, and in the sluggish recoveries that the US and the euro area have experienced since 2008. Notes: All values are subsample averages expressed in percentage points. Labour productivity is real GDP/hours worked. The Keynesian growth framework suggests that monetary policy during a stagnation trap is hindered by credibility issues, making it hard for the central bank to engineer an exit from the trap. Hence, monetary policy alone is unlikely to be sufficient to jumpstart an economy in a stagnation trap. We consider policies that increase investment in productivity-enhancing activities, either through subsidies or direct government intervention, with the intention of sustain the growth rate of potential output. We find that these policies could push the economy out of a stagnation trap and restore full employment by re-anchoring expectations on the high-growth equilibrium. Crucially, our framework suggests that only a sufficiently aggressive intervention can be effective. Public policies aiming at stimulating investment can push the economy out of a stagnation trap only if they induce a regime shift in agents’ expectations about future growth, re-anchoring the economy to its high-growth, full-employment equilibrium. The Keynesian growth model teaches us about the conduct of policy in a low-growth environment. We believe, however, that there are many more exciting research and policy-relevant questions that a Keynesian growth perspective would shed light on. Acemoglu, D and J Linn (2004), "Market size in innovation: theory and evidence from the pharmaceutical industry", The Quarterly Journal of Economics 119(3): 1049-1090. Adler, G, R Duval, D Furceri, S Kilic Celik, K Koloskova, and M Poplawski-Ribeiro (2017), Gone with the headwinds: Global productivity. IMF staff siscussion note 17/04. Barlevy, G (2007), "On the cyclicality of research and development", The American Economic Review 97(4): 1131-1164. Benigno, G and L Fornaro (2017), "Stagnation traps", Review of Economic Studies, forthcoming. Blanchard, O, G Lorenzoni, and J L'Huillier (2017), Short-run effects of lower productivity growth: A twist on the secular stagnation hypothesis, NBER working paper 23160. Bustos, P (2011), "Trade liberalization, exports, and technology upgrading: Evidence on the impact of Mercosur on Argentinian firms", The American Economic Review 101(1): 304-340. Di Bella, G and F Grigoli (2018), Optimism, Pessimism, and Short-Term Fluctuations, IMF working paper 18/1. Eggertsson, G, N Mehrotra, and J Robbins (2017), "A model of secular stagnation: Theory and quantitative evaluation", NBER working paper 23093. Moran, P and A Queralto (2017), "Innovation, productivity and monetary policy", Journal of Monetary Economics, forthcoming. Obstfeld, M and R Duval (2018), "Tight monetary policy is not the answer to weak productivity growth", VoxEU, 10 January. Rachel, L and T Smith (2015), Secular drivers of the global real interest rate, Bank of England working paper. Summers, L (2013), "Why stagnation might prove to be the new normal," The Financial Times, 15 December. Yellen, J (2016), "Macroeconomic Research After the Crisis", Speech at the Federal Reserve Bank of Boston, October. This is consistent with empirical evidence provided by Blanchard et al. (2017). Using US data for the period 1991-2014, they showed that downward revisions in forecasts of future productivity growth were associated with unexpected falls in consumption and investment. An analogous conclusion has been reached by Di Bella and Grigoli (2018), who considered a large sample of countries. See Acemoglu and Linn (2004) and Bustos (2011) for empirical evidence on the positive response of firms' investment in productivity-enhancing activities to exogenous increases in market size. Barlevy (2007) provided evidence that firms’ investment in R&D is procyclical, because the profits linked to innovation are higher in booms than in busts. This does not mean, however, that the fundamentals of the economy are unimportant. In fact, we found that stagnation traps can arise only if fundamentals are such that the real interest rate in the full employment steady state is low enough. It has been argued that, since the early 1980s, factors such as population aging and higher inequality have increased the supply of savings in several advanced economies (Rachel and Smith 2015, Eggertsson et al. 2017). In this respect, our framework suggests that the same structural factors that have increased the supply of savings might have also exposed advanced economies to the risk of self-fulfilling stagnation traps.